Sponsor a Kennel – Limited Space Still Available! With 21 kennels sponsored, we’re going strong, but we still need your help – and we have 26 more cat kennels and 15 more dog kennels to go! We rely on these sponsorship dollars to cover veterinary care, blankets, and bedding. But for the animals in these kennels, it’s all about the food, enrichment toys, and the special attention they get from visitors who see their Kennel Sponsor signs! In fact, in just the few months that kennel sponsorships have been active, over 50% of the animals in our sponsored kennels have gotten adopted – go team! 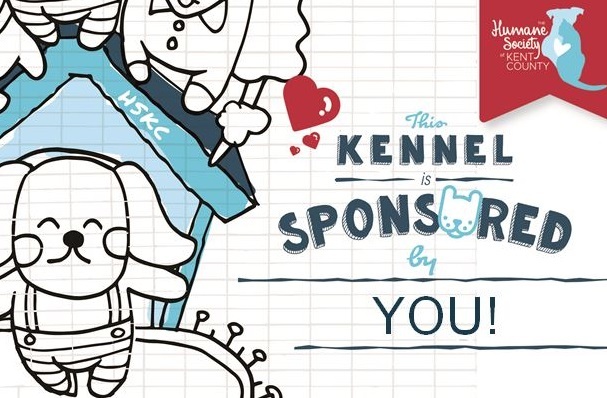 You get a personalized sign with your family or company name, updates about the pets who occupy your sponsored kennel, a certificate of sponsorship for your home or office, and invitations to special HSKC events! And don’t forget – Kennel Sponsorship could be a memorial for a loved one or beloved pet, or a gift in honor of a person or occasion! Call us at 443-282-0063 or email Sandy Appel at sappel@kenthumane.org today!